I'm not vexed by (more) oud perfumes hitting the market...I'm bored with perfumes that proclaim their oud affiliation on their bottles: oud-this, oud-that — Oud! Aoud! Oudh! If a fragrance is heavy on orange blossom or cedar or sage we usually don't see those ingredients listed on labels ad nauseum. Perhaps the only other ingredient besides oud that is as advertised in perfume names is rose. So: when I hear an announcement of another oud fragrance, I don't frown or sigh, I give it a try. Just this year I fell in love with, and bought, Diptyque's Oud Palao. Perfumer Bertrand Duchaufour, listed notes of cumin, whiskey, saffron, aldehydes, coriander, tuberose, iris (fraction), clove, ylang-ylang, sandalwood, Laotian oud, immortelle, amber, musk, vetiver, patchouli, Cestrum, piss (hyraceum),1 heliotrope, caramelized notes, tolu balsam. $245 for 50 ml Eau de Parfum. Perfumer Bertrand Duchaufour, listed ingredients of rum, rose berries (rose hips? pink pepper? ), saffron, cinnamon, davana, Damascus rose, St. Thomas berries (sea buckthorn berry? god only knows), Nagarmotha (Cypriol), Laotian oud, patchouli, cistus, ambergris, sandalwood, leather, white musk, vanilla, caramelized notes, tolu balsam. $220 for 50 ml Eau de Parfum. Oud Shamash starts off as a spiced rum cordial: peppery, colored with saffron threads, stirred with cassia bark; the heart notes deliver a fresh/lively leather aroma (this is brand-new, expensive 'designer' leather). Rose, cypriol and vanilla lead to the smooth/silky oud-ambergris finale. At the end of its development, I find Oud Shamash addictive: it smells of freshly cut wood mingling with incense ash. Of the two fragrances I'm reviewing today, this is my favorite and it's in heavy use this week while I'm in the beautiful high desert of Arizona in Flagstaff. Both Oud Shamash and Oud For Love present a resinous/woody, incense-y oud note (I have no idea if it's genuine oud or artificial, but it smells great). The oud note blends beautifully with all ingredients in both fragrances and is most noticeable in Oud Shamash. 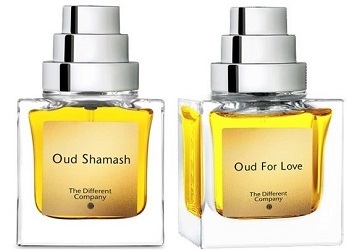 Both perfumes are unisex with Oud Shamash tilting a bit masculine and Oud For Love leaning towards feminine. The poll: join me in some oud-love by naming a recent oud perfume you enjoyed. 1. Ed. note: Kevin's tongue in cheek term for hyraceum. Piss was not, in fact, listed in the official notes. Al Hareem by Yas Perfumes. At least, I assume it has oud, because there is a medicinal-menthol-almost-Band-Aid note that is the perfect foil to the bright bright rose in it. I don’t normally like sour green roses — Rose Splendide sends me running for cover — but this one, to me, is the perfect summer rose. And Thirty Three, but that’s a touch too masculine for me. Otherwise I’ve learned to dislike oud. Have tried so many oud perfumes that either were matt and depressing, or assaulted my nose with pure acetone. Serendipity: someone on another site has just posted a split of Mukhallat Dahn Al Oudh Moattaq oil. Am in for 1ml and very intrigued! Well, look on the bright side: at least TDC didn’t call it Piss for Love. None the less, now they’ve said P word, TDC may have released an evil genie. I can see/sniff the flankers now: Acqua di Parma’s Colonia Intensa d’Piss, Tom Ford Private Blend Piss Wood, Byredo Parfums Piss Immortel, Armani Prive Royal Piss, JHAG Midnight Piss for Women, and (this actually sounds interesting) Thierry Mugler Alien Piss. Hilarious!, I would buy Alien Piss. LILLYJO: copyright the name immediately! Too funny!! Holding my sides. Noz: ah…give me credit for that. Truly, that note smells like piss, pure and simple…so I used “piss” myself (I consider this an accomplishment since it got by Robin’s eagle eye)…I’ll insert a note saying that’s my word and not The Different Company’s! You fooled me, Kevin! I thought this was a new French hipster thing. I’m relieved – no pun intended! Hahahaha, you’ve made my day!! A new category of scent awaits!!! STILL laughing at this,and coming up with names of perfumes…!!! I”m like you and fell in love immediately with Oud Palao. I have also recently been trying the Francis Kurkdjian Oud Moods series in samples and so far like Satin Mood the best. It’s got so much other good stuff–violet, rose, vanilla, amber–that I’m not sure the oud in it really matters very much, but it smells divine! Calypso: well, a little oud goes a long way…so it may dominate. I’ll have to smell that one. My favorite Ouds are still Byredo Accord Oud and Acqua di Parma Colonia Intensa Oud.They both fullfill my Oud requirements.These two have been on the market for quite a while though! Nice review. I like Al Oudh and wonderoud though I think they are not ranked too highly. Kanuka: I remember liking Al Oudh, but wonderoud was not oud-y enough for me if I remember correctly. So many ouds have been sampled at this stage! solanace: Montale ouds…I ignore. Try a few quirkier ouds before giving up. I think you might like Oud Cuir d’Arabie, which has the emphasis on the leather. thegoddess: have not tried those but love the names. Another fan of Oud Palao here! Another beautiful one is Oudh Infini by Parfums Dusita. Thanks, Lucas…I’ll add Oudh Infini to my to-try list. I like Oud Shamash, too. Got my bottle in a swap with a friend, who called it ‘vile’. Perhaps I should try Oud Palao next. I really like La Via del Profumo’s Amber Oud, which wobbles the line between “oooo” and “ewww”. Nishane Musiqa Oud is gorgeous. And I quite enjoy Dior Oud Ispahan. But my favorite remains Tom Ford Oud Wood. pixel: Oud Wood is very nice.